Obtain a cheap car hire in Portugal by making your booking online on our website and enjoy a country with an amazing history which unique in the world. In Portugal you can find a variety of unique landscapes. Beaches, mountains, charming villages or cosmopolitan cities….all within your reach with a car hire because Portugal has a network of completely renewed roads. Just like neighboring Spain, Portugal has a rich and diverse cuisine. If you are a trveller who likes to tr all what the local gastronomy has to offer, then don’t miss the opportunity to try the ‘Francesinha’ a specially tasty sandwich of the ‘Caldo Verde’ a peculiar cream or soup or any of the variety of seafood available. Artisan bread and wine makes this very enjoyable for the palate. Just hire a cheap car hire in Portugal and you and fully enjoy all the delicacies on offer. Take advantage of our offers, hire a cheap car hire in Portugal and make the most of this wonderful country with an amazing climate and with some of the most popular tourist destinations in Europe. Here are a few of the most popular destinations of our clients in Portugal. Lisbon is the city of the seven hills, one of Europe’s greatest historical and cultural cities. We recommend that you venture out with your rental car and get to know this city, admire it from its highest point by funicular or use the traditional yellow trams to take you around the steep streets. 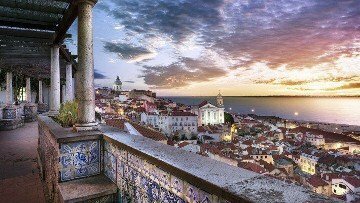 During your visit to Portugal, we recommend a walk through the traditional Alfama district and get lost in its narrow streets, a visit to the Medieval Castle of San Jorge, the imposing Lisbon Cathedral or contemplating the views from the Mirador de Santa Lucia with its blue tiled walls. In Belém, the famous Belém Tower, the Jerónimos Monastery, both World Heritage sites awaits us. The colourful streets of Barrio Alto, the Plaça do Comèrcio or the views from the Vasco de Gama Bridge and the ‘Estufa Fria’ greenhouse in the impressive Eduardo VII Park is a place for you to relax in the middle of the city. Faro is one of the main destinations in Portugal, due to its important international airport and access to the popular Albufera region. We recommend that you take a walk around the city, visit the old town with its pedestrianized cobblestone streets, numerous squares and white or tiled buildings, so characteristic in Portugal. Do not forget to do some shopping in the commercial shopping area where you can find the big fashion names or visit the Ría Formosa natural park or Praia de Faro. Porto is without a doubt one of the most attractive destinations to visit whilst in Portugal with your car hire. On the banks of the river Douro, this city of bohemian style and British influences retains its charms of yesteryear. Enjoy your visit to Porto and the beauty of its buildings by visiting the Palacio da Bolsa, the San Bento train station, the Clérigos church or the San Ildefonso church. A visit to the magical bookstore Lello e Irmao, one of the most beautiful bookstores in the world, or take in amazing aerial views of the city from the Dos Guindais Funicular. Undoubtedly, one of the essential views to see of the city is at sunset on the banks of the River Duero. Here you can see the typical ‘rabelo’ boats, stroll along the ‘Muelle de la Ribera’ (docks) and the Luis I bridge to take in some of the delightful gastronomy the city has to offer in Vila Nova de Gaia area. Here you can also take a visit to the famous wine cellars where the popular Porto wine is made. The exotic island of Madeira is another popular tourist destination. Madeira is volcanic, green and rugged with high cliffs and pebbly beaches and overflowing with tropical vegetation makes this island an ideal holiday destination. Visit Funchal, the capital of Madeira with your rental car and visit the beautiful villages of Santana, Porto Moniz or São Vicente. Dive into the lush forests of Laurisilva or the spectacular ‘Levadas’ (water ways with hike paths) or take a visit to the neighbouring island of Porto Santo to enjoy the beautiful beaches and more than 9km of coastline. Travelling around Portugal from North to South is the perfect plan for an unforgettable holiday. Prepare your bags and your car hire and let us take a visit to the best destinations in Portugal. Our car route begins in the north of Portugal, and the beautiful city of Guimarães, considered the birthplace of Portugal and declared World Heritage of Unesco, with its narrow cobbled streets and traditional architecture takes you back to the middle ages. Stroll around the historic old town of the city and visit the old castle of Guimarães, the Palace of the Dukes of ‘Braganza’, walk along the ‘Largo República do Brasil’ avenue until you reach the ‘Nossa Senohora da Consolaçao’ church. Use the cable car to take you to the ‘Monte da Penha’ for some of the most spectacular views of Guimarães. From Guimarães we travel to Coimbra with our car hire. This delightfully well-preserved medieval old town was once the country’s capital for over a hundred years and is home to the historic University of Coimbra. From Coimbra, we move onto Porto with our car hire to visit the old town, the wonderful churches & cathedrals. Take a boat ride along the Duero river and visit some of the best wine vineyards in Vila Nova de Gaia. In the centre of Portugal, we can find Óbidos, a beautiful city famous for its castle and medieval wall that was often patronized by the Queens of Portugal from the middle ages until the 16th century. Inside the city, narrow streets of white houses edged with vibrant yellow or blue paint and a beautiful Arab castle that gives great personality to the city. After Óbidos we take our car hire until we reach Sintra, declared a World Heritage Site due to its many 19th century romantic architectural monuments. Mountains and forests surround this beautiful city of palaces, which is why it undoubtedly makes it the most magical city in Portugal. The ‘Do Pena’ Palace, or the Sintra National Palace of Andalusian style, the ‘Dos Mouros Castelo’ or ‘Quinta da Regaleira’ are certainly places that will surprise you on your car hire route around Portugal. We continue our car route until to Natural Park of Sintra-Cascais and from here to the small and luxurious costal village of Cascais. This former fishing village gained fame as a resort for Portugal’s royal family until the late 19th century and early 20th century. Nowadays it is a popular holiday spot for the rich and famous due to its exclusivity and beautiful beaches of fine white sand. We arrive at our next destination on our car hire route, and just 25kms we can find Lisbon. When you arrive, we recommend that you park your car hire and take the tram 28 to visit the best parts of the city. A must is the Alfama area, the castle of San Jorge and the centre of the city, also known as ‘La Baixa’. Going inwards, the interesting city of Évora awaits us. This city has over 2,000 years of history and where the Roman & Muslim cultures have left their mark. We head to the South of Portugal where the popular tourist destination of the Algarve awaits. This part of Portugal is the most visited area of the county. Touristic coastal towns, natural reserves and typical fishing villages where time seems to stand still makes this region of Portugal perfect for your route with your car hire. Next, the lovely village of Lagos awaits. Its old town and buildings such as the Forte da Ponta Bandeira, the San Antonio church, the market or the wall that surrounds the village makes for a perfect plan before we enjoy the wonderful beaches of Praia do Pinhão and Praia da Dona Ana. Why not hire a boat and enjoy a trip inside the caves of the Ponta da Piedade mountain. Then visit Silves to discover the charm of a traditional Portuguese village with its old reddish castle, cobbled streets and typical buildings and boats on the Arade River. The last destination on our route is Faro, the city’s Arco da Vila is on the site of a gate that was part of the original Moorish wall and this archway leads to the old town with its cobbled streets. It is also home to the university which gives the city a lovely feel and which comes alive at night-time. The city is surrounded by lagoons and salt marshes and is the starting point of the beautiful Natural Park of Ria Formosa. From here, a last point of call to Estoi and a visit to the rococo (late Baroque) palace of Estoi with its distinctive pink walls and blue tiles surrounded by beautiful decorative gardens for you to enjoy.